AstroAlert » В Андромеде возможно вспыхнула карликовая Новая (типа UGWZ)! В Андромеде возможно вспыхнула карликовая Новая (типа UGWZ)! Написал: Короткий Стас в категорию Новые. Отлично видно голубой цвет вспыхнувшей карликовой Новой и красный цвет полуправильной переменной NSVS 3968322 (в нижнем правом углу). D=180mm, F=720mm, Newton+ Canon 350D(a), 120sec@iso800, Green canal. Есть сразу 6 подтверждений с территории ex-USSR! 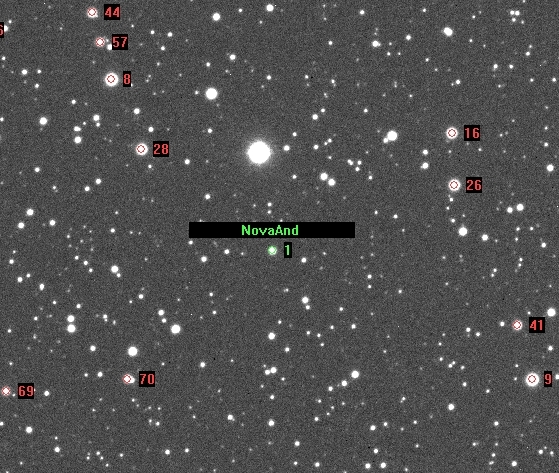 Stanislav Korotkiy, Moscow; and T. Kryachko and B. Satovskiy, Kazan State University (KSU), confirmed possible nova in And (mag approximately 12.45m, reference star TYC2841-00810-1, V=11.68m) on the one unfiltered 300-s image taken on Sep. 1.834 UT with 8.0-cm f/7.5 ED-refractor (+ SBIG ST-2000XM) at KSU’s Astrotel Observatory (Karachay-Cherkessia, Russia). The new object is located at R.A. = 02h00m25s.43 +/- 0″.1, Decl. = +44o10′18″.68 +/- 0″.1 (equinox 2000.0). 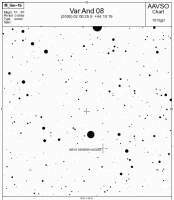 We see that comparison with a Palomar Oschin Schmidt telescope plate (DSS) obtained on 1992 Dec. 22 (POSS-II Blue), shows the presence at this position of an apparent star with blue mag about 20.5. Possibly, this is candidate UGWZ (WZ Sge). S. Shurpakov (Tauris-1 obs., Baran’, Belarus) confirmed possible nova in And (mag approximately 12.46m) on the one unfiltered image taken on Sep. 1.821 UT with 19.0-cm f/5 Newton-reflector (+ Artemis 285 CCD camera). The new object is located at R.A. = 02h00m25s.43, Decl. = +44o10′19″.0 (equinox 2000.0). V. Nevskiy (MPCCOD B42, Vitebsk, Belarus) confirmed possible nova in And (mag approximately 12.28m +/-0.01, reference star from USNO-A2.0 Red) on the summ 3×30-s unfiltered image taken on Sep. 1.846 UT with 30.0-cm f/5 Newton-reflector (+ QHY-6 CCD camera). The new object is located at R.A. = 02h00m25s.39, Decl. = +44o10′18″.7 (equinox 2000.0). I. Chekalin (Taganrog, Russia) confirmed possible nova in And (mag approximately 12.17m, G-canal, reference star from TYC-2, V) on the one 120-s unfiltered image taken on Sep. 1.842 UT with 18.0-cm f/4 Newton-reflector (+ Canon 350D(a) DSLR-camera). The new object is located at R.A. = 02h00m25s.63 +/- 0″.34, Decl. = +44o10′17″.45 +/- 0″.27 (equinox 2000.0). 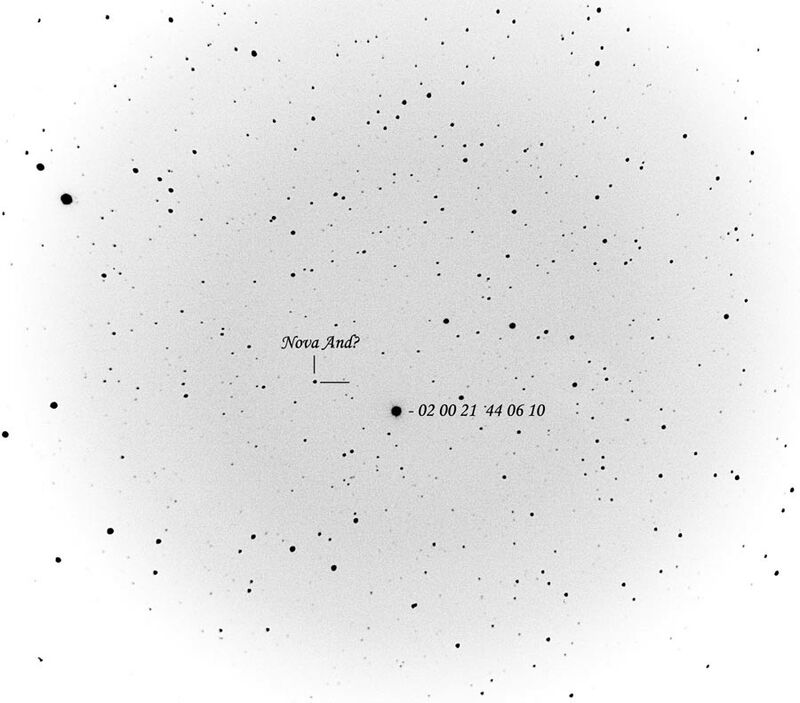 M. Andreev (MPCCOD B18, Terskol, Kabardino-Balkaria, Russia) confirmed possible nova in And (mag approximately B=12.9m, V=13.0m, R=13.3, reference star from USNO-A2.0 USNO 1275_01206028 and USNO 1275_01205895) on the 10-s images taken on Sep. 1.836 UT with 28.0-cm f/6.8 Celestron 11 NexStar GPS (+ Apogee 47E Alta CCD-camera). The new object is located at R.A. = 02h00m25s.42, Decl. = +44o10′18″.4 (equinox 2000.0). Скорее всего это карликовая новая типа WZ Sge (UGWZ), так что стоит ожидать переменность с периодом порядка 1.5 часа с амплитудой не более 0.5 зв. вел. 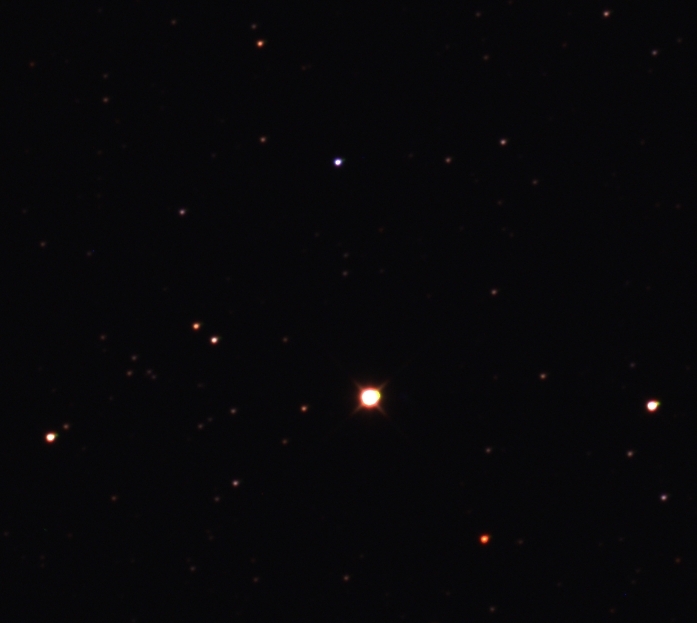 Photometry of the object obtained by T. Kryachko, S. Korotkiy, D. Denisenko and B. Satovskiy with 8.0-cm f/7.5 ED-refractor (+ SBIG ST-2000XM) at KSU’s Astrotel Observatory (Karachay-Cherkessia, Russia) during JD 2454711.343 - 2454711.434 clearly shows a humped light curve with an amplitude of 0.13m and a period of 0.055(1)d which is typical for cataclysmic variables of UGWZ type. 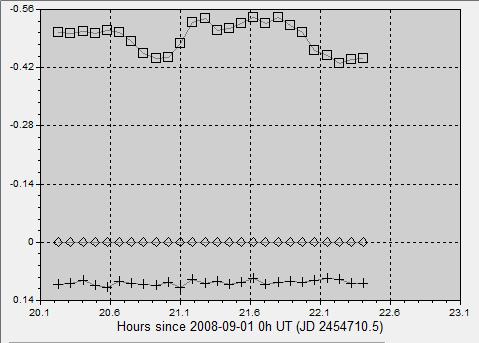 The light curve in relative mag.